on their health and their family’s well-being. It’s : Make this your first SugarFree! Day. 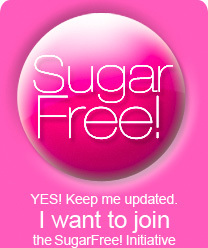 of experts and laypeople joining together to address and promote the personal and social benefits of going SugarFree! What is wrong with sugar and flour? More than sixty percent of Americans are overweight or obese and current scientific research proves that the cause is foods that are promoted by USDA guidelines. Sugar addiction is a serious problem, and sugar and other junk foods cause food cravings, malnutrition and weight gain. Eating sugar and refined foods makes losing weight nearly impossible and causes many of the diseases American are afflicted with, including diabetes, fatty liver, heart disease and a host of other health related issues. Your sweet tooth can kill you. Watch the videos of October and November. Pass them around. Submit your favorite for December and January. The SugarFree! Initiative is challenging America, -- and that means you! -- to abstain from all forms of sugar. We are encouraging parents and school officials to make their local schools sugar-free environments. Join us in our mission to expose the foods that are literally killing Americans and help stop the abuse by the major food conglomerates. Education is the key and once we know what sugar is doing to us an where it is hidden in the products that we buy, we can chose and be free... SugarFree! Make your child’s school a sugar-free zone. Yvonne Sanders-Butler understands the effects of sugar and refined foods and has made a tremendous difference in the lives of thousands. She has established a Sugar Free Zone Wellness Program for her school and has shared her success with other schools and familes thorughtout the country. She offers a principal-created, parent-tested, kid-approved nutrtion plan that lays out how to transform schools and bring nutrtion into the curriculum and then home and includes celebrations, menus and practical advice. Dr. David Kessler on his new book, The End of Overeating, On why We Can't Stop Eating. Food addiction is as real and powerful as an addiction to cigarettes, drugs and alcohol. The food industry knows this and they have manipulated our food source, the same way Big Tobacco has, in order to secure our addiction and dependance. 1. Sugar decreases the vitality and number of white blood cells and that impairs the immune system. 2. Sugar and refined foods cause hypoglycemia, which is associated with anxiety, weakness, confusion and sleepiness. 3. Higher blood sugar increases inflammation and oxidation in the body and results in lowered cognitive function. 4. Because of increased insulin production, sugar and refined foods contribute to hyperactivity and memory difficulties in children. 5. Sugar and refined foods in the blood stream makes platelets sticky causing inflammation which increases blood pressure, blood clots, strokes and bad cholesterol. 6. Because sugar robs your body of chromium and is associated with a lack of essential fatty acids, sugar and refined food are association with depression, anxiety and aggression. 7. Refined food and sugar cause Type II Diabetes. 8. When sugar hits the bloodstream, it forms advanced glycation end products, which damage collagen and elastin -- which in turn causes wrinkles. 9. Sugar and refined foods result in a higher phosphorus-calcium ratio which is a cause of osteoporosis. 10. Eating sugar and refined foods causes abdominal fat, fatty liver and an overweight body. get the word out, take a stand.